Services are held every Sunday. At approximately 10:30 a.m., the Phap Hoa youth group meets for games, singing, dancing, and rehearsals for upcoming religious and cultural performances. At noon the main service commences. It consists of chanting and praying for deceased community and family members. Sometimes the main service will include reading from the sutras. Other services, held later in the day on Sundays, consist of readings of sutras, attended mainly by elder members of the community. The temple also offers Vietnamese language classes for youth and Buddhism classes for teenagers and adults. It does not offer culture or religion classes for children. The temple has additional services which have higher attendance rates) around the full moons, for Mother’s Day, the New Year, and Buddha’s Birthday. After South Vietnam fell in 1975, many South Vietnamese fled the country. Fort Indiantown Gap near Harrisburg, Pennsylvania was one of the principal resettlement sites for South Vietnamese refugees to the U.S. Many Vietnamese refugees left the immediate area to later resettle in other parts of the U.S., but a Vietnamese community has existed in south central Pennsylvania since that time. 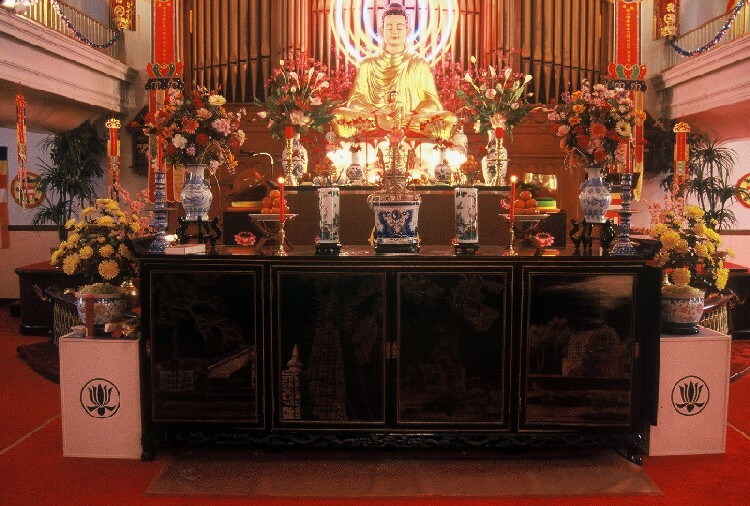 The Vietnamese Buddhists in the central-Pennsylvania region decided to form a religious community. Initially, they worshipped in a rented apartment. As the number of community members increased, they found the lack of room and the lack of available parking problematic. 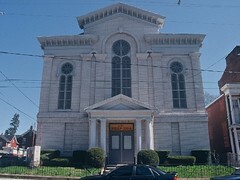 In 1993, the group collected donations and purchased its current temple. 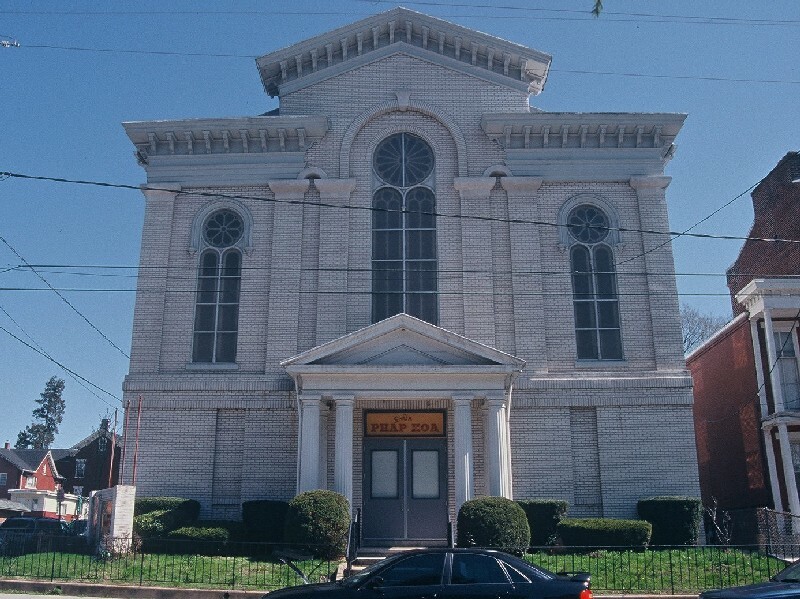 The building was formerly a United Methodist Church. The population at Phap Hoa Temple is comprised of immigrants from Vietnam and their American-born children. Among the younger members, English is the primary language, while Vietnamese is the primary language among all other members. The age range is great. There is a high concentration of members ages fourteen to nineteen. There are also a significant group of active senior members. Phap Hoa Temple was formerly a United Methodist Church. The building is tall and white, with three large vertical windows in the front. The portico consists of a triangular pediment with three doric columns on each side. Members enter the temple through a side door. The main doors are a newly painted bright red with a sign above them reading “Chua Phap Hoa.” In front of the building, a white brick framed sign faces the road, reading “Buddhist Association of Pennsylvania Phap Hoa Temple.” There is also a lotus painted on this sign. Congregants enter from one of the three red side doors; the front door is locked to the outside. The side entrance leads to a large social hall, with a kitchen to the left and a stairway to the immediate right leading up to the main worship room. The space smells pleasantly of incense and cooding. There is another doorway on the right further down the hall, which is the entrance to what congregants call “the lobby.” The social hall is ornately decorated with Buddhist flags and other wall hangings. There is a wooden stage and pews in the center. This area is mainly used for the youth group meetings, classes, and for meals. There are long folding tables and chairs that line the walls on both sides of the stage. The social hall also sits adjacent to two small offices. Beyond them are bathrooms to the left, and stairs to the right leading up to the back of the main worship area. Following the wooden stairs up to the worship area is a landing where worshippers leave shoes before entering the main worship area. The main worship area shows its Methodist origins quite clearly. There are three sections of pews in a U shape facing the altar. In the center of the front wall are the large organ pipes, no longer in use, left over from the church. In this area, the smell of incense is strong, and bright colors fill the room. The room is painted a light gray, with maroon carpeting. The room is lined on either side with three stained glass windows. The geometric shapes of the stained glass are another remnant from the Methodist church. Sections have been replaced with lotus flowers. In between the windows are Buddhist flags. 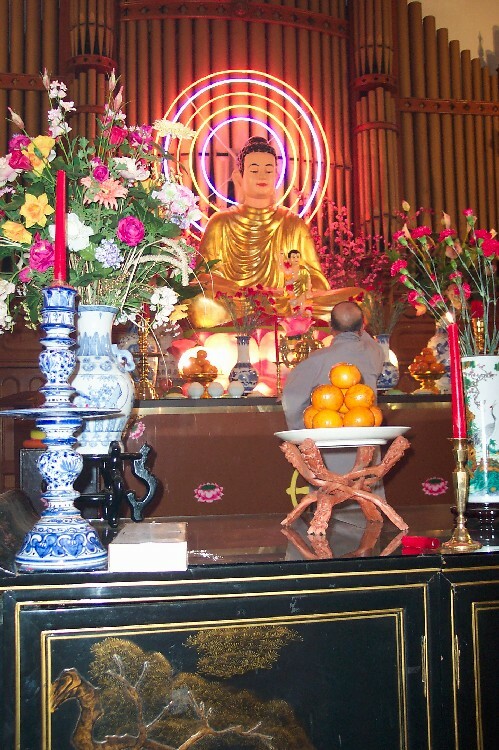 A large statue of Buddha faces the congregation in front of the organ pipes. 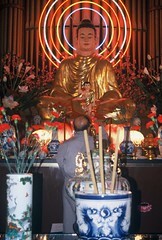 The Buddha statue is about six feet tall, in a sitting position with crossed-legs, with gold robes and his black hair pulled into a bun. Behind the Buddha’s head there is a set of blue, yellow, orange and white (traditional Buddhist colors) neon lights in concentric rings. 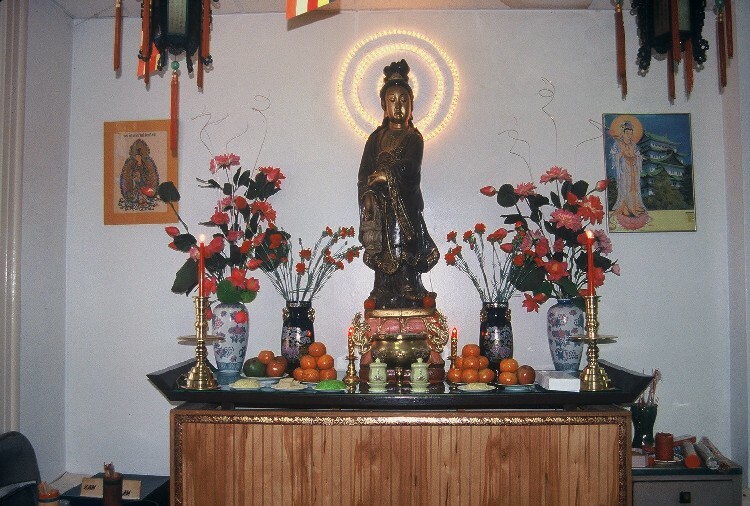 (This statue of Buddha was brought to the U.S. by community members from Vietnam.) In front of this statue is a smaller standing Buddha also dressed in gold. This Buddha also gazes towards the worshipers, and his hand is held up to the sky. The ears of both Buddha statues are elongated, signifying longevity. 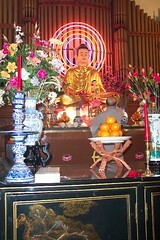 In front of the Buddha is the altar. Fruit platters, rice, candles, flower bouquets, and an incense holder with sticks of incense burning can be found on the altar. On either side of the Buddha are drums with fish etchings. On the floor in front of the altar is a prayer mat and a smaller wooden drum similar to the ones flanking it. On either side of the organ pipes are long painted wall hangings that stretch from the ceiling to the floor with gold symbols. Overall, the space is ornately decorated with Buddhist flags, garland balloons, and colored lights hung from the balcony. The balcony itself has a small altar in front of three paintings of Bodhisattvas. 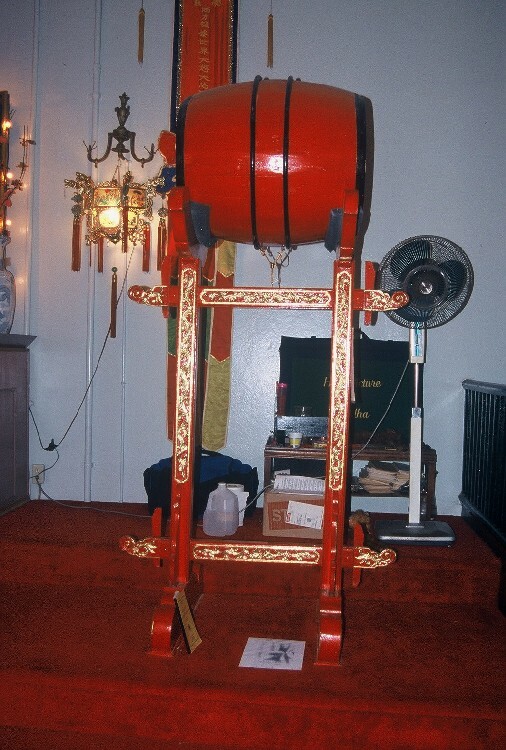 On either side of this altar are a large red drum and a large black bell. The exit on the left leads directly to a small prayer room. It continues on to the stairs from the side entrance. The small prayer room is devoted to two altars. 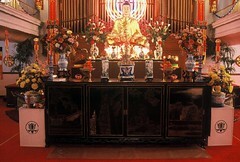 The first has a statue of a Bodhisattva; her altar contains incense and flowers. The other altar in the room is devoted to the deceased. The room’s walls are covered with photographs. A table is set up with a larger photograph, as well as flower offerings. 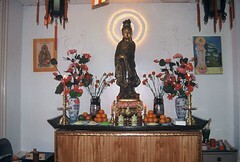 In this small room, one finds a large picture of Buddha’s mother hanging on the wall.